How Long Will the So Cal Tuna, Dorado, Wahoo and Marlin Bites Continue? It is Nov. 16 as this report is being written. At the time of this report it can still be said there are yellowfin tuna, dorado, wahoo, yellowtail and striped marlin biting on the offshore fishing grounds. How long the bite will continue to be is anybody’s guess, but today we are seeing the passing of a powerful northern weather system bringing gale force winds to Southern California. Striped marlin, yellowfin tuna, dorado, yellowtail and wahoo were all on the offshore menu heading into the storm and once the storm passes it will be interesting to see what effect the strong winds may have had on the water temperature and the fishing. This storm is powerful and it might be enough to roll the water, lower the water temperature and send many of these warm water fish to other locales to seek out warmer temperatures during our cold weather months. Time will tell what might remain of the 2015 offshore fishing season, but one way or the other the 2015 offshore fishing offshore fishing season has been a wild ride. Striped marlin still bit into mid-November with the best action found by boats fishing between Santa Barbara Island and the 17 Fathom Spot. Several boats reported catching and releasing multiple striped marlins during a day of fishing over the past weekend with the top boats getting 4 or 5 releases in a day. At Catalina there was striped marlin activity reported at Cat Canyon outside of Cat Harbor and also for boats fishing spots around the East End of the island. The area around the East End of Catalina sounded best and boats fishing in the region on Nov. 14. The San Diego region weekend saw a striped marlin caught and released by a boat fishing about half way between South Island and the 425 Bank in mid-November. Boats fishing around the 425 Bank and around the Upper Hidden Bank also reporting finding some striped marlin activity. Wahoo also remain in the offshore picture. The occasional wahoo was caught by boats fishing 5 miles off Mission Bay, at the 9 Mile Bank, at the Coronado Islands, in the area 1 to 6 miles west of North Island and in the region of the 425 Bank. Wahoo action was reported on trolled Marauders, trolled marlin jigs, on cast and retrieved wahoo bombs, and on live bait that is fished around kelp paddies. 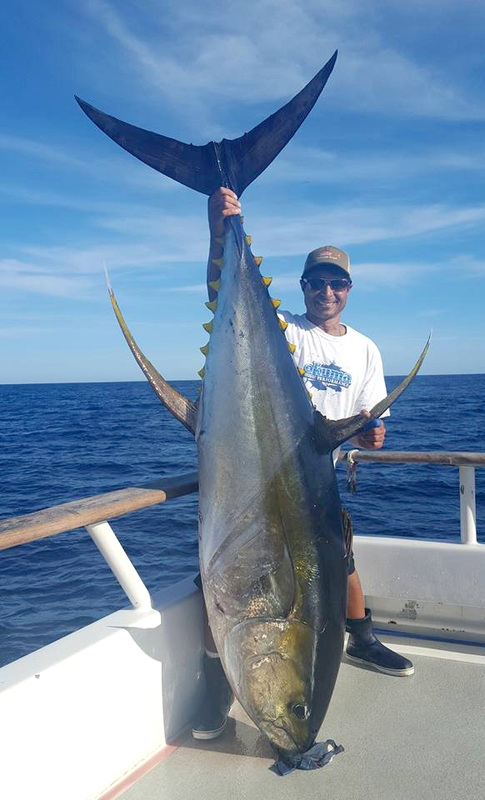 Yellowfin tuna are also still providing action offshore with recent days having Skippers report finding kelp paddies holding biting yellowfin tuna while fishing the region of the 289 Spot, the 425 Bank, the 371 Bank and the Upper Hidden Bank. 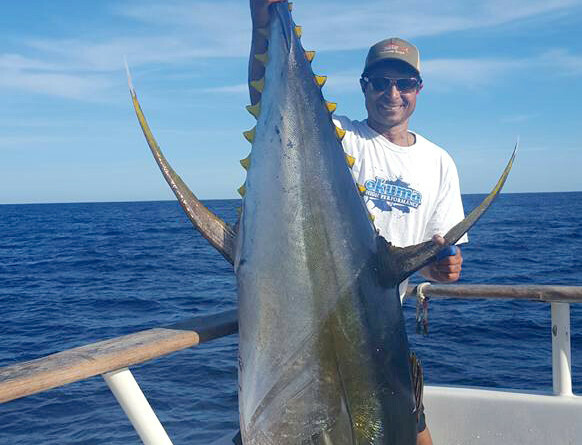 A recent outstanding catch of yellowfin tuna, skipjack, dorado and wahoo was reported by private boater Craig Boegler of Gooey Duck. Boegler reported finding a kelp paddie while fishing about 3 miles west of the 425 Bank at 22 miles 194 degrees from Point Loma. Boegler reported catching a 55 pound wahoo along with filling out their limits of yellowfin tuna and dorado. The most recent 1.5-day trips out to the Cortes Bank found some yellowfin tuna biting but the numbers were down from what they were when there was good yellowfin tuna action going on the week before. In addition to yellowfin tuna, the Cortes Bank has also been producing a mix of yellowtail, skipjack and bonito. As an example of the most recent fishing at the Cortes Bank, Condor out of Fisherman’s Landing ran a 1.5-day trip had 31 anglers catch 4 yellowfin tuna and 60 yellowtail on Nov. 14. Dorado have been biting under kelp paddies found in the area of the 289 Spot, the 302 Spot, the 371 Bank, the 425 Bank, the Upper Hidden Bank and the 390 Bank. There have also been a few dorado biting on the troll in these same areas. Private boater Capt. Bob Woodard of Christina Lynn reported about fishing a recent trip to the area around the 425 Bank. He said he was invited to share a kelp paddie by a Skipper who had a wide open dorado bite going. He accepted the invitation and said the dorado bite was indeed wide open and easily caught their limits of quality sized dorado up to 12 pounds. The fishing around Los Coronado Islands has been good for a mix of yellowtail, bonito, skipjack and an occasional wahoo. The best yellowtail bites were found while fishing along the weather side of North Island and at the Middle Grounds. There have also been some yellowtail bites along the San Diego County Coast. The numbers of yellowtail being caught along the coast are not high but most weigh in the 15- to 25-pound range. Most of the yellowtail are being found in the lower half of the water column and are being caught on yo-yoed iron or live baits that are fished on a dropper loop rig. The yellows are usually located by finding sonar marks or meter marks over hard bottom areas that are often fished for rockfish. Productive spots have been hard bottom areas outside of Box Canyon, Leucadia, Del Mar, Mission Bay and Imperial Beach. The tremendous 2015 offshore fishing season was still producing action prior to the weather system currently passing through. It will be interesting to seen what remains in the way of tuna, dorado, wahoo and striped marlin in our local offshore waters once the stormy weather passes. Keep on fishing and I hope to see you out on the water!